For the Sonic Riders racecourse, see Sky Road. 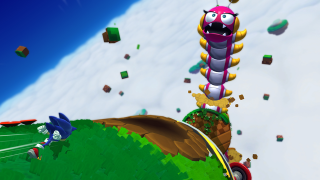 Sky Road (スカイロード Sukairōdo) is the sixth world of Sonic Lost World. Set high above the skies where clouds and floating ruins are located, this world primarily reuses many assets from previous worlds like Windy Hill. Here, Sonic finally meets Zavok, only to discover that time is running out as the world below is dying and Tails is going to be converted into a robot soon. In the 3DS version, the player can gather Black Material here. — Sonic Lost World website. Zone 1 is set in an area similar to Windy Hill in aesthetics and design, but set in the sky with some noticeable differences such as giant Caterkillers that burrow through planetoids and waterfalls and the use of the Crimson Eagle. At the end of the Zone, Sonic must bounce on clouds and defeat a turtle Badnik by knocking its missiles back at it to reach the capsule. This is a 2.5D Zone with the ruins from Silent Forest. While proceeding through the level, mechanical dragons appear to either shoot Sonic down with fireballs, use lasers to shock him, or use their robotic parts to knock platforms out. Zavok will then challenge Sonic using one of the mechanical dragons. This is an autoscrolling Zone where Sonic flies through the air like in Tropical Coast Zone ?. By holding down the Homing Attack button, Sonic will curl into a ball and descend, while letting go makes him ascend. The player has to avoid Badniks as they soar through the air and eventually encounter a giant Badnik that must be defeated to clear the Zone. Zone 4, based on Desert Ruins with a stormy background, is one of the longest Zones in the game, spanning many sections. The first and fifth sections require Sonic to scale 2.5D towers filled with obstacles such as Boos, Ball Hogs, trampolines and disappearing sand blocks. He must be careful not to backtrack in these sections, as the camera will not scroll down, resulting in instant death. The third section is similar, but the player goes down instead of up, going down sand slides and avoiding Sols. The Magenta Rhythm can also be used to climb the towers here. Inbetween each tower ascent/descent is a giant sand slide played from a 3D perspective where Sonic has to avoid spike balls, Badniks, cacti and falling off. There are poles in which Sonic can grab onto so he can move along, but some them are unstable and will break after a few seconds. The first 3D slide is played from behind Sonic, while the second one is played with the camera in front of Sonic. At the very end of the Zone, the player must face off with Zavok atop a mechanical dragon. In this extra Zone, Sonic has to travel along disappearing green blocks throughout the sky, avoiding Badniks and spike balls. There are plenty of rings and extra lives to collect, so bringing a Lightning Shield here is recommended. Zone 1 has the player go through a casino area like those seen in Frozen Factory Zone 3 in the Wii U/PC version, but from a 2.5D perspective. The key difference here is a giant BINGO table which requires the player to flip tiles and make lines, eventually opening the way forward. Other obstacles include fans that blow the player up into the air, and Badniks such as Slicers, Crawls and Egg Pawns. Cyan Laser also appears here. Zone 2 continues through the casino, but this time it's in 3D. Most of the Zone revolves around using Indigo Asteroid to ascend higher and higher, eventually leaving the casino and reaching the clouds. Zone 3 has the player fly through the skies on top of rockets that are controlled using the gyroscope on the 3DS system to travel between pieces of land. However, there will be many obstacles in the sky such as Badniks and spike balls that will knock Sonic off the rockets, resulting in the hedgehog falling to his demise. There are also lengthy areas which require extensive use of Parkour to pass through them. Also throughout the Zone are the mechanical dragons from the Wii U/PC version's Zone 2, who will pop out of clouds and try to shoot Sonic out of the sky with giant fireballs. 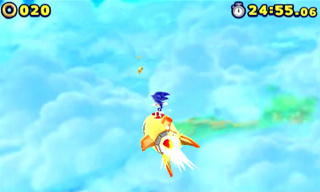 Sky Road was also one of the three standard stages of Sonic Runners, and would appear after reaching Episode 10 of Story Mode. It was a Fly Type stage, and contained obstacles suitable for Fly Type characters such as Tails.